Here is a look back at what our readers enjoyed the most in 2013. What started as a research project turned into our most popular page. People wanted to what types of new musical instruments are being invented, and how they are getting launched as new business ventures. Our biggest surprise, was seeing companies return to kickstarter to launch their second instrument. A look into manufacturing by lasercutting. 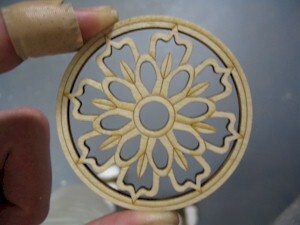 Luthiers remain skeptical remain about the quality of lasercut soundboards, but for designing rosettes and other accessories, it is an accepted practice. And who doesn’t love a record cut from wood instead of vinyl. The Margaret Guthman competition offers big prizes, and helps promote interest in designing new musical instruments. A quick peek inside of our music labs. Great sounding instruments are being developed with this upcoming manufacturing technique. Marine Bioacoustics, Thermoacoustics and more ! People searching on how to build own trombone. Usually we recommend the DIY approach, but in this case, we suggest otherwise. There is a temporary position available in our research project “3DMIN – Design, Developement, and Dissimination of New Musical Instruments” (33 months). Basic-level knowledge of German is a prerequisite for this position. Email the contacts on this page for more details. The Awesome Foundation is awesomely giving out awesome grants of $1000 to promote awesomeness.